Richard Pachter: So, what's the story? 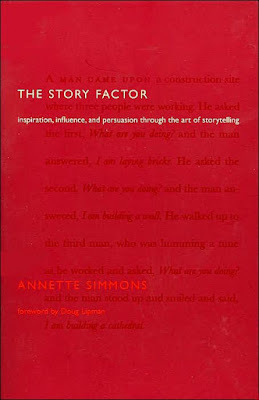 The Story Factor: Inspiration, Influence and Persuasion Through the Art of Storytelling. Annette Simmons. Basic Books. 272 pages.. When we're little, we love to hear stories. It's so deeply rooted, most never lose their hard-wired affection for tales. Perhaps it's the narratives' natural hopefulness as they attempt to make sense of the seeming randomness of existence. Or maybe we just like to be entertained. Before written language, elders and shamans ensured the preservation of tribal legends and traditions by reciting stories conveying lessons and values to their people. Myth and parable are potent tools for maintaining cultural and religious continuity, observance and loyalty. Stories involve the listener in ways naked facts cannot. Humans preternaturally identify with stories, filtering things through their own psyches and experiences. In McLuhanesque terms, storytelling is a "hot" medium, eliciting responses on a number of levels. Tales resonate for a variety of reasons, according to Annette Simmons, a Greensboro, N.C.-based speaker and author. Lots of psychological explanations are offered, fortunately without excessive mumbo jumbo. Suffice it to say, stories tap into our consciousness — individually and collectively — in emotional and intuitive ways. Marketing theorists (and six-year-olds) understand that most purchases are triggered by "want," not "need." Again, emotion beats rationality. It's the difference between "I love you because . . ." and a passionate hug and kiss. Arguments, after all, are usually won on emotion, not reason, in spite of all pretensions to the contrary. Even most "logical" advertising (like Volvo's campaign emphasizing safety) is loaded with visceral subtext. No-brainers succeed because they're usually all-heart. The most memorable television commercials possess narrative threads, however thin they might be ("Wassup!?"). Companies tap into the power of stories for advertising and marketing, but there are plenty of internal uses. In addition to conveying corporate culture (a form of tribalism, to be sure) an organization's plans and goals can be communicated in this manner, or in variations thereof. Business models are, after all, attempts at telling a story in advance; a pre-metaphor, perhaps. Great leaders set examples; living their stories and communicating by action (emotion), not instruction (logic). Stories are the best way to convey these things, says Simmons, serving up a host of stories to illustrate her points. Some, as you would expect, are more compelling than others, and fail to leap off the page. Others are more memorable (just don't ask me to recall them right now). The problem is that Simmons covers a lot of ground, which tends to diffuse the focus. If any book begged for an abridged audio version, this is it, as an aural presentation of the material might make the process less cerebral and more affective. But if you have a little patience, Simmons' thoughtful book ably demonstrates the power of storytelling, and the many uses for it — mercenary and otherwise. Be careful, though; as the venerable storyteller Stan Lee once wrote, "With great power comes great responsibility." published Dec. 30, 2000 in The Miami Herald.